EU foreign policy chief calls for a relief of the Israeli naval blockade on Gaza, ignores the ongoing transfer of goods into the region. 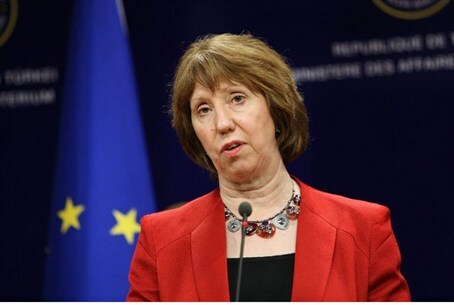 European Union foreign policy chief Catherine Ashton called on Thursday for a relief of the Israeli naval blockade on Gaza, which is ruled by the Hamas terror group. "It is World Refugee Day and I chose to be here on this day," Ashton said from Gaza in remarks relayed by her office and quoted by AFP. "We want to see the crossings open, and the economic situation improved," she said in a remark directed to Israel at a joint press conference with UNRWA Commissioner General Filippo Grandi. Ashton praised UNRWA's work and pledged that the EU would "continue to be the strongest supporter, that we will give the financial support that is needed, but also the political support." Hamas officials, with whom Ashton did not meet, urged her to "act immediately to lift the siege of Gaza" and "remove Hamas from the list of terrorist organizations" of the EU, arguing that Hamas simply “defends its people and believes in democracy and openness to the world." Gaza’s Hamas terrorist rulers constantly claim that the region is under an “Israeli siege”, ignoring the fact that Israel continuously allows humanitarian aid into Gaza. Israel has approved hundreds of internationally funded and monitored projects in Gaza. Last month, a convoy carrying medical aid from Saudi Arabia entered Gaza, with 10 tons of medicines and medical equipment. Israel has also supported the private sector in Gaza, and has approved the transfer of raw materials for private sector construction, including roof tiles, building stones, dry wall, mosaics, adhesives, plaster, etc. Meanwhile, Hamas is the one that has tried to punish the residents of Gaza by attempting to reduce the scope of Israeli goods entering the region. Hamas does this because it is angry that Israel and the Palestinian Authority cooperate over what is transferred into Gaza, ignoring Hamas which rules the region with an iron fist. Gaza’s Hamas terrorist rulers have also hosted a slew of Arab leaders in their “besieged” territory. These have included the emir of oil-rich Qatar who brought money for the Hamas government in October, Turkish Foreign Minister Ahmet Davutoglu, and Egypt’s Prime Minister Hisham Qandil.